It’s ‘all change’ round here, as a station guard might have said back in the mid-19th century when this was our railway station. 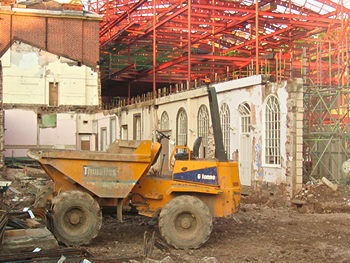 The redevelopment of this building – more recently known as ‘West Offices’ – is underway, to form a new headquarters building for City of York Council. 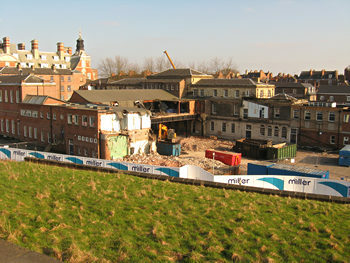 The site is easily viewed from Toft Green/Tanner Row on one side and from the bar walls on the other. 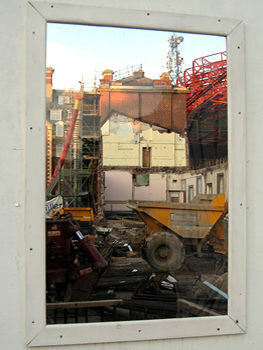 I had a wander alongside it via the gates near the war memorial, where small windows in the wooden hoardings offer more close-up views. The windows are of plastic, and this being a building site they’re not suprisingly somewhat dusty, so these views are rather blurry. 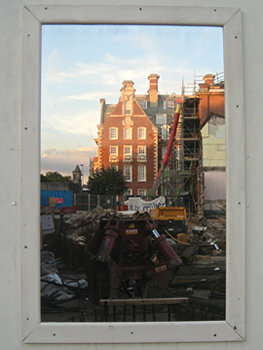 But I liked the way the windows offered a ready-made frame for views of the site, and of the former railway offices across the road. The building known as West Offices was originally our railway station, before the current station outside the walls replaced it. 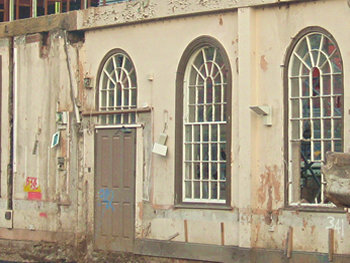 The windows in the hoardings gave views of some of the architectural details from the original building. As it was used as railway offices for decades, various modern additions had presumably obscured some of these Victorian details. 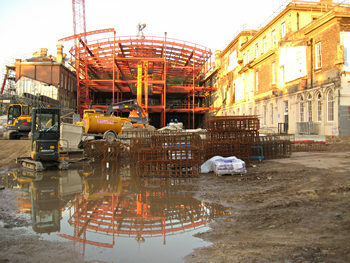 The platforms and rail lines used to occupy the space now occupied by a massive steel structure, part of the new additions being built around and alongside the Victorian buildings. I’ve taken photos a few times when passing. 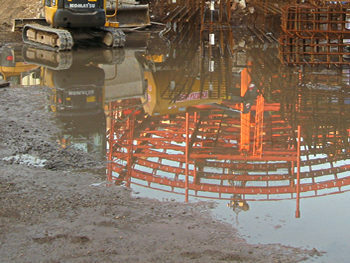 These wider views of the site, showing the development over the last six months, can be enlarged if you click on them. 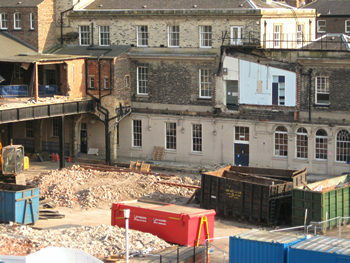 Left – seen from the bar walls, in early March, when various bits of more modern structure were apparently being demolished. Below left – about a month ago, late July, seen from the other side on Toft Green. 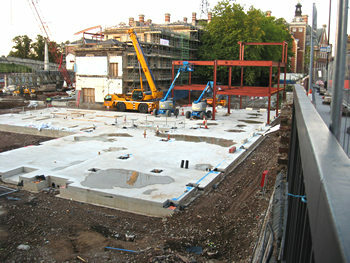 Below right – roughly the same view, in late August, with concrete foundations in place (for an adjoining hotel, I think). The 1844 Hargrove guide also said: ‘It is an extensive and splendid structure, and is not excelled by any station in the kingdom for convenient arrangement, and suitable adaptation to all the requisite purposes.’ Let’s hope we can bestow similar praise on it once it’s remodelled as the City Council headquarters. 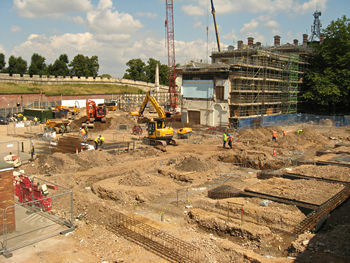 There’s been an archaeological dig on the site – uncovering Roman remains. There are some really nice photos of the finds on Flickr.com. There’s been a lot of digging here – and not always related to archaeology or building work. Gardens and a plant nursery once occupied this site. But that’s a story for another time. The station building which replaced it is of course still in use, and I’ve recently included an appreciation of the railway station, having wandered into it via one of the new cycle/pedestrian routes. A brief page on the current council offices recognises that the building on St Leonard’s Place isn’t really appropriate for a 21st century city council. Also on this site are pages compiled some years back (2004) with more photos and information on the railway buildings in the area – the railway offices and the station. See: Railway City and Station Rise. In some respects a little out of date, but may be of interest. Update – since added, more on the history of this site, in York’s early nurserymen. There are several later pages, under the tag ‘West Offices‘, added since this page was compiled. Page compiled August 2011. Updated: 8 Feb 2013 and (updated links) 23 Nov 2018.